Our St. Patricks Day Cubic Zirconia Lucky Shamrock Irish Clover Leaf Pendant is a beautifully detailed pendant displaying your Irish heritage! Three, 1 carat each, 6mm heart shape emerald green man made gemstones are accented by an outline of diamond look round cubic zirconia stones and include approximately 4 carats in total carat weight. 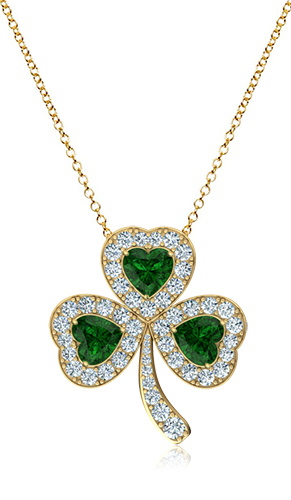 The shamrock includes a hidden bail to accommodate your choice of a 16 inch or 18 inch fine rope chain. The three heart shaped stones are available in your choice of emerald green, sapphire blue or ruby red simulated gemstones and diamond look, canary yellow or pink colored cubic zirconia, please see the pull down menu for options. 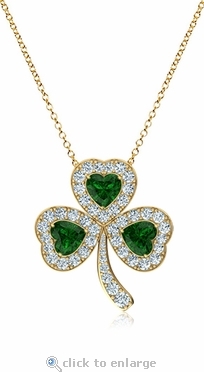 This clover leaf pendant is available in a solid 14k white gold or 14k yellow gold mounting and measures approximately 26mm in length and 23mm wide. 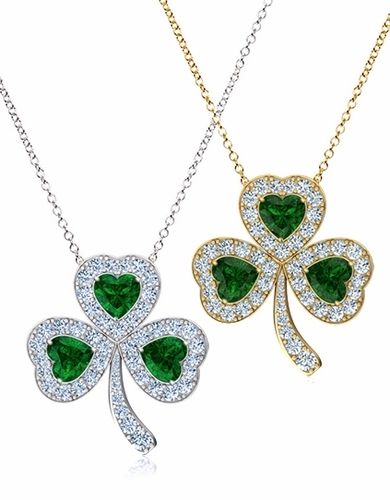 Our Russian formula cubic zirconia are hand cut and hand polished to exact diamond specifications and our simulated emeralds are the best quality available for a stunning finished St. Patricks Day Shamrock Pendant. For further assistance, please visit us via live chat or call us directly at 1-866-942-6663 and speak with a knowledgeable representative.